On February 23, 2019 at 1:00 p.m. at the M&T bank 8314 Pulaski Highway, Rosedale, MD 21237, an unknown suspect forcibly robbed a customer of cash who was operating the indoor ATM. The suspect then fled on foot towards Philadelphia Road. The suspect is described as a white male, 5’10” to 6’00” in height, 175 lbs. to 200 lbs. 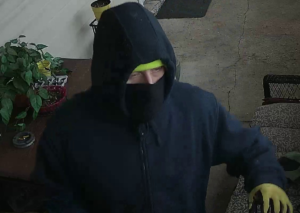 in weight, wearing a dark blue hooded sweat jacket, fluorescent knit cap, black fabric mask, yellow gloves w/ black palms, blue jeans, and dark colored tennis shoes with fluorescent tongues. Submit a tip to Metro Crime Stoppers. If your tip leads to an arrest and charges in this case you may be eligible for a reward of up to $2,000. Call in your tip to 1-866-7-LOCKUP or submit an anonymous tip here.